Hear the sizzle start up as soon as the skillet or saucepan are placed on the burners. Stamp Play-Doh entrees including silly steak, imaginary eggs, crazy burgers, and even a funny fish with the 4 stampers. Create side dishes like pretend veggies with the half-moulds. 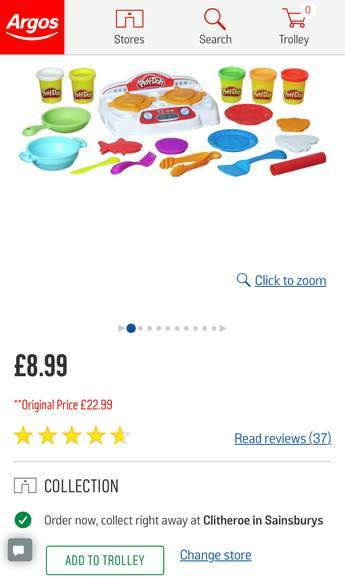 Grab and flip Play-Doh foods with the tongs and spatula. Cook up some play-doh fun with real sizzlin' sounds. Place the skillet or saucepan on the stove to start a low sizzle. 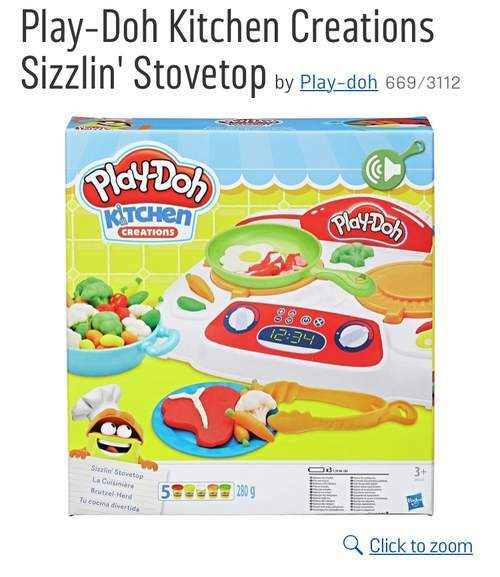 Toss a play-doh meal on the skillet or pan to crank it up to high sizzle. Includes 4 stampers to shape imaginary entrees. Plenty of play-doh colours for some side dishes, too. 5 cans of play-doh brand modelling compound. ‌ I’m afraid stock does seem limited.